Ready to make waves with your new bathroom? 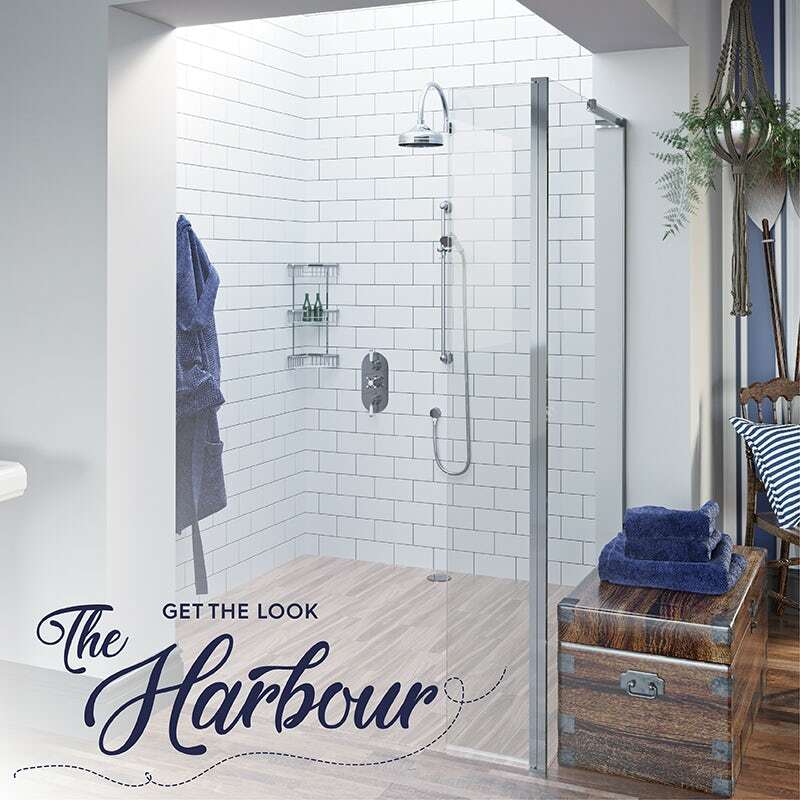 In the final edition of our latest “Get the look” style guide, I’ll show you exactly which VictoriaPlum.com products we used to achieve The Harbour look, helping you to create a nautical style that’s got your name written all over it. If you haven’t already read parts 1–3, it’s definitely worth going back through and catching up on this look. In part 1, I introduced you to the overall look and explained how it differs from other nautical styles in terms of products, colours and accessories. The products themselves form the main focus of part 2, where we discovered which items lend themselves to this style. Finally, in part 3, I had loads of fun accessorising the bathroom with the right colours, textures, walls and flooring. 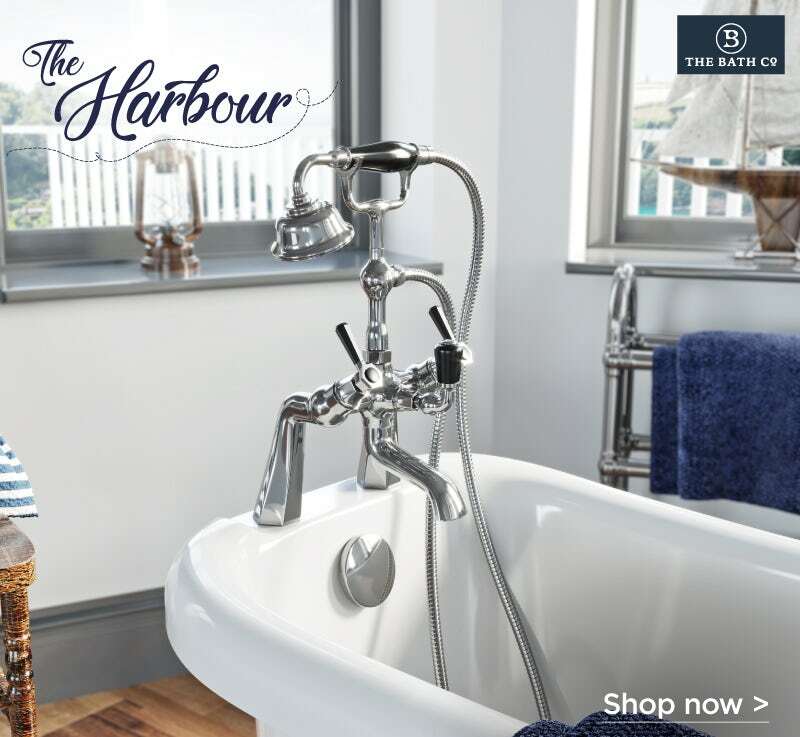 The Harbour look is a more refined nautical style, so we’ve opted for bathroom products with a traditional feel from The Bath Co. However, there are some contemporary touches which keep this bathroom looking fresh and modern. This classic bath forms the centrepiece of the whole bathroom design. With its slipper design, meaning one end is higher than the other, it actually resembles the shape of a boat which sets the tone for this nautical style. Made from high quality twin-skinned acrylic for durability and easy cleaning, your taps can be deck mounted at one end. We chose a white bath with white ball and claw feet, however there other colour and finish combinations available which could work equally well. Adding to the refined look, this 4 piece shower set is traditional in style with a gorgeous hooped wall arm and classic shower head. Further vintage-inspired embellishments can be found around the thermostatic shower valve, like black ceramic levers and a cross head handle. A detachable handset is ideal for washing hair and rinsing around your shower area, whilst an anti-scald cut out device provides safe and secure showering for the whole family. 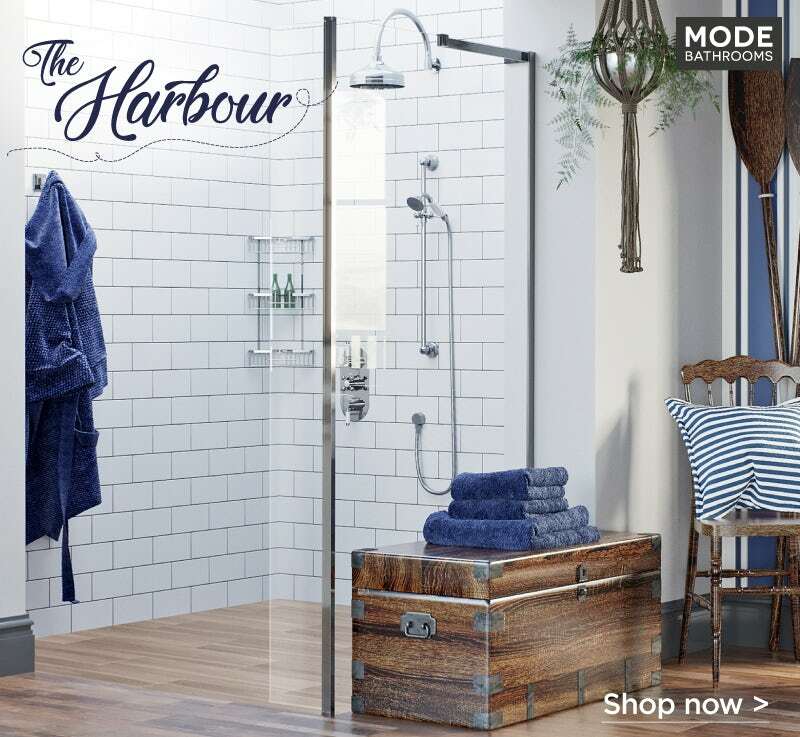 Bringing things bang up to date, this sleek wet room glass panel from Mode Bathrooms will keep your bathroom feeling light and spacious allowing The Harbour look to really shine through, all thanks to its frameless design. The 8mm British Standard safety glass conforms to BS EN 14478, the relevant standard for shower enclosures, whilst polished aluminium profiles and wall arm provide extra rigidity. A return panel helps keep splashes away from the rest of your room. Period elegance is the name of the game and what better way to add a touch of classic style than with this beautiful pedestal basin. 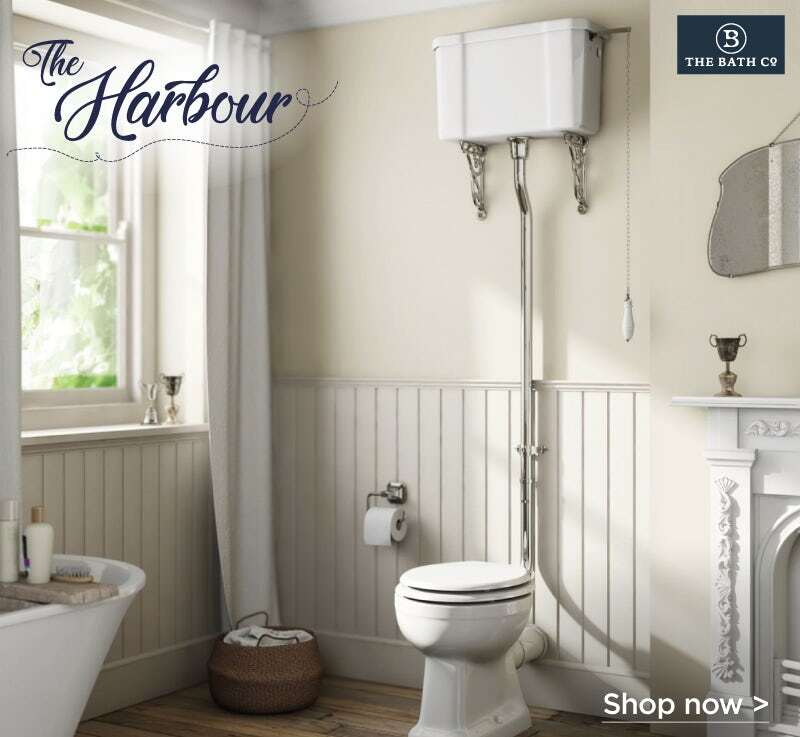 Complete with traditional embellishments and a surround that reminds me of waves on an ocean, this high quality basin will fit seamlessly with your nautical design. Add a second if you're sharing with shipmates! Whilst we haven’t displayed the toilet in our own room set, it pays to go for something classical that’s in-keeping with the rest of your décor. That’s why I’d heartily recommend this high level toilet. Complete with a traditional and ultimately satisfying chain pull flush, you can even cut the flush pipe to size, should you find your ceiling is a bit on the low side. Whilst these traditional taps have been designed with a nod to Art Deco styles, the black levers do two jobs in complementing the overall style. 1. Lever mechanisms work brilliantly well with nautical interiors as they can be found aboard boats. 2. The dark finish adds to our chosen accent colour. You can even discover how these taps are made. 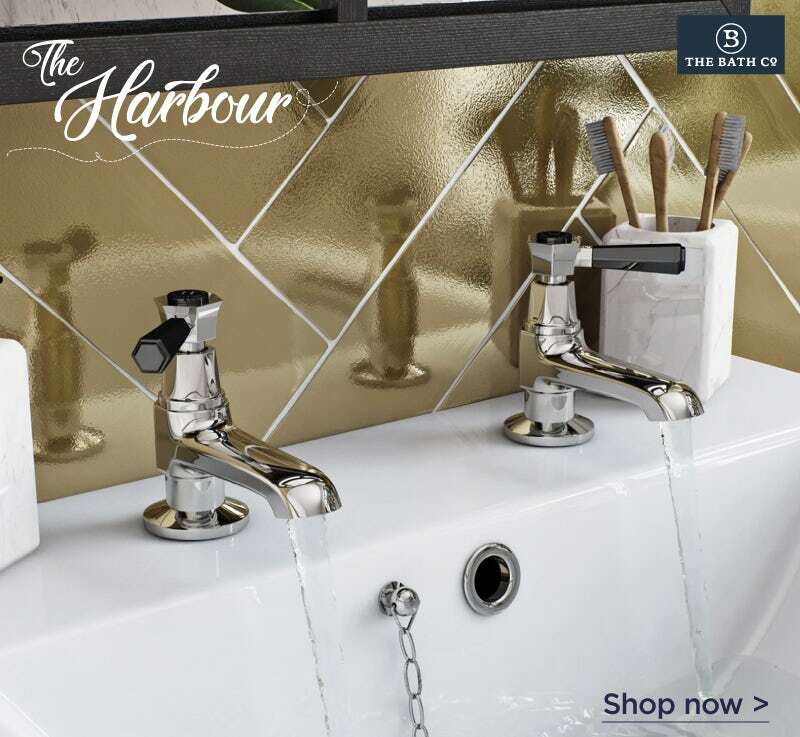 To match your basin taps, make sure you choose a bath mixer tap from the same collection. This one can be combined with traditional standpipes for a neat appearance. To achieve this look, you really can't go wrong with a combination of curves and chrome. 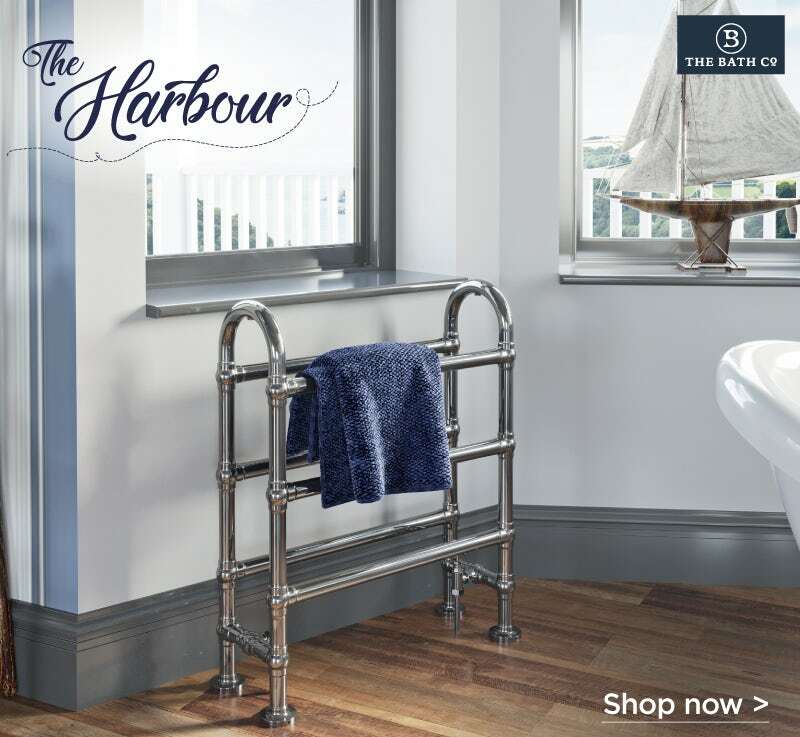 Featuring a delightful shape, this heated towel rail is as practical as it is gorgeous. With 2 rows of hanging space, it is ideal for family bathrooms, where multiple towels require warming. Metro tiles continue to be incredibly popular in both bathrooms and kitchens due to their versatility. As a timeless tile design, they can be used to complement both traditional and contemporary bathrooms, and can also be used in a variety of ways. 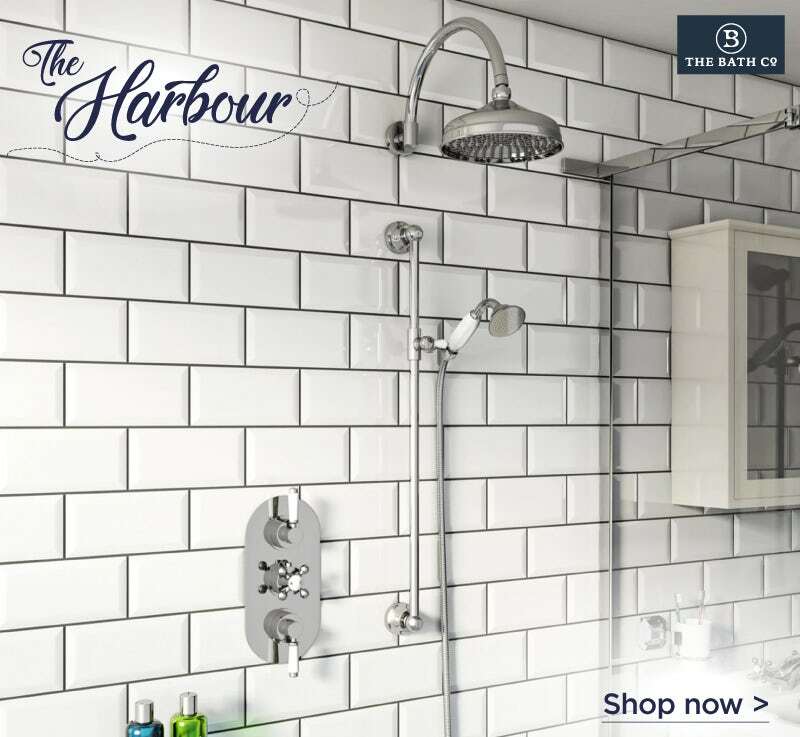 In The Harbour bathroom, we’ve used these flat white gloss metro tiles around the shower area, to create a clean, spacious feel. White forms the main colour in our palette, so we’ve also opted for white grout. With good quality vinyl flooring, you can easily achieve the look of a real wood floor without the maintenance issues that accompany it. We chose Krono Xonic’s aptly named Buccaneer flooring for our boat-themed decking as the vinyl planks come in a range of shades for a weathered appearance. 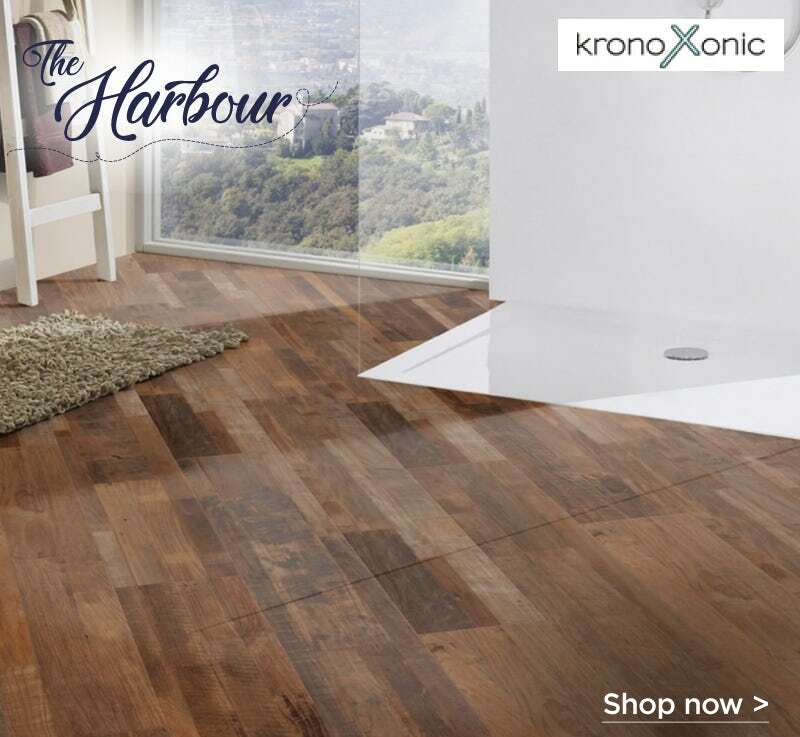 Krono Xonic flooring is actually so simple to install, you can do it yourself. 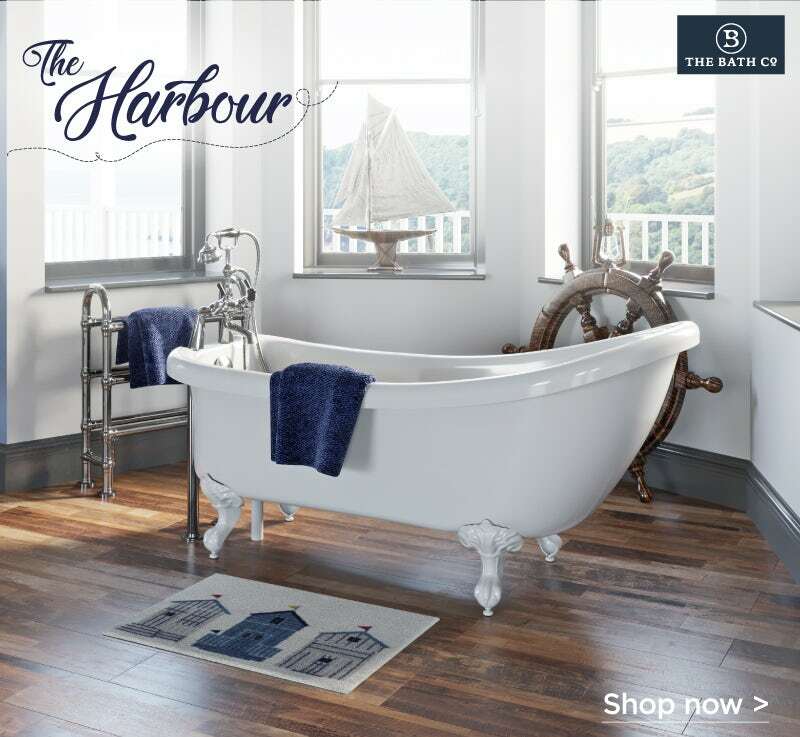 It’s self-levelling, with no adhesives or underlay required, plus with a scratch and stain-resistant, anti-bacterial surface it's easy to clean, so you can keep your bathroom looking shipshape with very little effort. 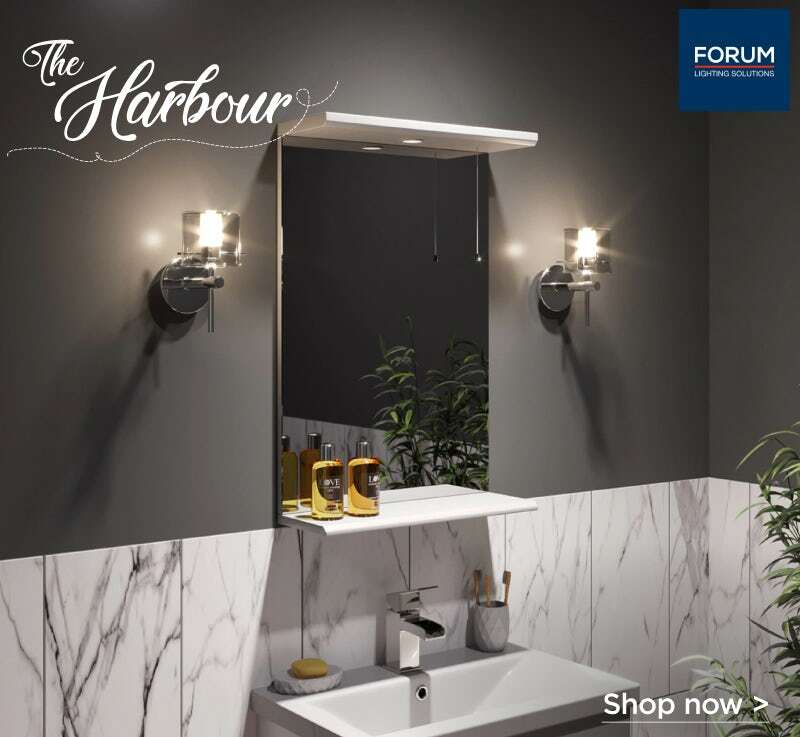 Finally, to add a little extra illumination, we chose this gorgeous wall light from the Forum lighting range. Whilst the style is certainly more contemporary when compared the rest of our decor, the cylindrical shape lends itself well to the nautical theme—think portholes and rings. Why not browse our style guides section and “get the look” you’ve always wanted. 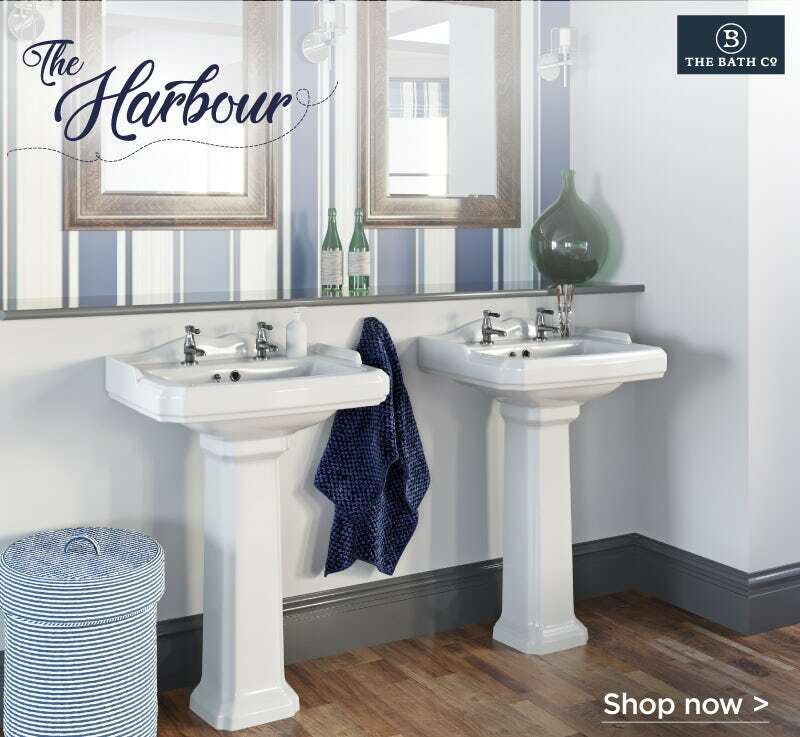 Make sure your bathroom is more yacht club than Club Tropicana with our latest Get the look style guide.